Yesterday Johnnemann described our fan translation system— as we lead up to launch (just a day and a half away! August 15!) I wanted to highlight one of Gone Home’s more unique features: our Modifiers system. It allows you to tailor certain aspects of the game to fit the experience you imagine. Gone Home, in its standard form, is about exploring a dark house, turning on the lights as you go, unlocking doors and finding audio diaries that tell the story of a year in the life of the Greenbriar family. The dark house is foreboding and atmospheric; the locked doors allow us to arrange the story in some semblance of order as you open up new areas; and Sam’s voice provides a human connection to the story. But we think there are a number of possible experiences contained within Gone Home, and we wanted to allow purists and casual explorers to experience the game differently if they so desire. That’s where the Modifiers screen comes in. 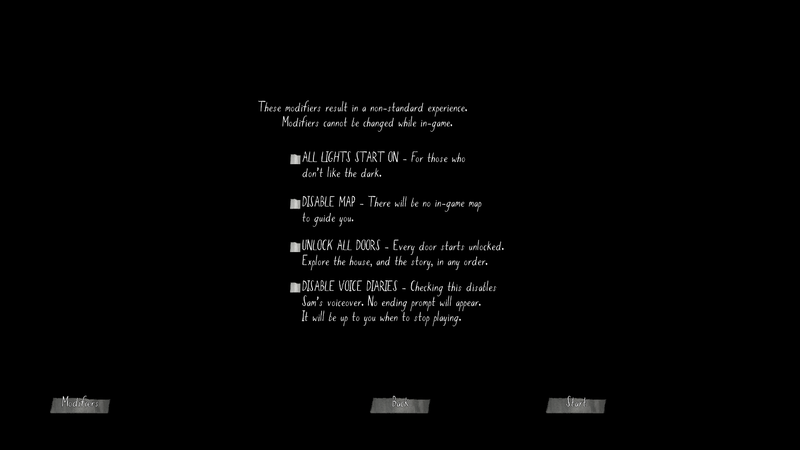 When you start a new game, you can optionally choose from four modifiers: All Lights Start On, Disable Map, Unlock All Doors, and Disable Voice Diaries. Some players might be picturing a very literal exploration experience– they don’t want audio diaries playing in their ears, or a map helping them find their way; they just want to find the physical artifacts left behind and piece together what they can, and track their location in the house by memory and landmarks as they would if they were exploring the Greenbriar residence in real life. So this player could Disable Voice Diaries and Disable Map, for that purist explorer approach. Or you might not want to deal with peering into the darkness as you navigate the house, or searching for keys and clues to unlock doors– you just want to explore the space at your own pace, and not worry about what might be going bump in the dark. For the player that wants full run of the place from the beginning, they could try All Lights Start On and Unlock All Doors. All of the modifiers are mix-and-match, to fit how you want to play. I think one interesting experience, for instance, will be for players to try turning off Audio Diaries, exploring as much of the house as they can, then starting a new game with Audio Diaries turned on, to reveal a new side of the experience and “complete” the story. Or for players that unlock all the doors and explore the story completely non-linearly, to see what it’s like doing the equivalent of starting with chapter 3, then skipping back to chapter 1 and so on. It’ll be fascinating to see what people think is the “best” way to experience Gone Home! But of course, all these Modifiers are totally optional– the game with all Modifiers turned off is the canonical way to play, the experience that we’ve designed as intended. But we didn’t want to make Modifiers a New Game+ deal, where you were forced to play through the whole game “our way” before we unlocked the ability to play it “your way.” No matter how you decide to play through Gone Home, we can’t wait til folks have their hands on the game, and can share their thoughts… release is less than two days away!! We’ll have more updates before the game goes live. Keep an eye here! It’s cool that you guys included a system like this. I might turn off the map for my first pay through but apart from that I want to experience the game the way you guys envisioned it. Could I ask, how frequently do the voice diaries play? If they’re on do you still get plenty of silent exploration scenes? great decision! i wish there were more of those options in games. can’t wait to play the game and see how it all works. I like the idea of playing without a map, it lends to a more organic and simple experience of exploration. That said for progression of the narrative it could linger a bit when you’re trying to backtrack. I don’t see the modifiers when I start a New Game or in the options screen. When you click New Game, and it shows the control scheme, there should be three buttons: Start, Back, and then Modifiers should be all the way to the left.